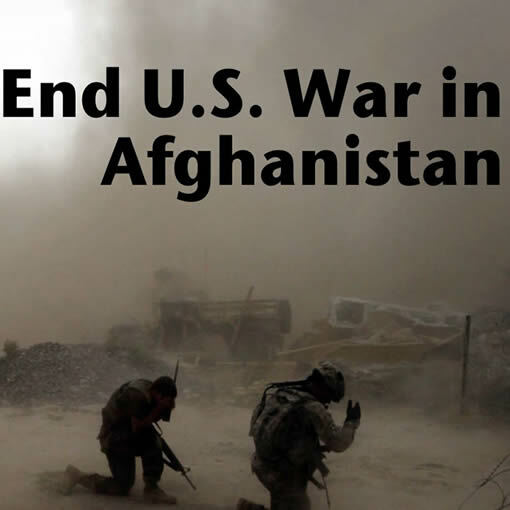 The United States is threatening sanctions against judges at the International Criminal Court should they continue their years-long investigation into the U.S. war on Afghanistan -- a war which, in less than a month, will begin its 18th year. A long list of prominent U.S. citizens and organizations, and thousands of additional signers, have put their names to a letter asking President Donald Trump to live up to his campaign promises and get the U.S. military out of Afghanistan. The coalition will be gathering signatures through October 2nd and delivering them to the White House that day. Candidate Trump said this: "Let's get out of Afghanistan. Our troops are being killed by the Afghans we train and we waste billions there. Nonsense! Rebuild the USA." Sharifa Akbary, Afghan-U.S. writer, speaker. Medea Benjamin, Co-Founder of CODE PINK: Women for Peace. Matthew Hoh, resigned in protest from his post in Afghanistan with the U.S. State Department over the U.S. escalation of the war in 2009. Liz Remmerswaal, Coordinator of World BEYOND War in New Zealand. David Swanson, Director of World BEYOND War. Brian Terrell, Co-Coordinator of Voices for Creative Nonviolence. Ann Wright, retired U.S. Army colonel and U.S. State Department official. These free events are listed on the World BEYOND War website and on Facebook.